Cardiff Blues coach Dale McIntosh doubts Welsh rugby can afford to fund ex-Welsh Rugby Union chief David Moffett's proposed fifth region. McIntosh would love to see former team Pontypridd return to top-tier status, but says efforts should be made to strengthen the four existing teams. However, McIntosh thinks a fifth region could be set up in north Wales. "If anything we need to solidify the four [existing teams] before we go looking to expand it," said McIntosh. "I'm guessing that expansion probably could be up north Wales. "Again that would be even harder to ignite because of the lack of resource - player resource I mean and support up there [and it] being a footballing area. "I'm only speculating, but we need to sort out our four regions here first. "We need to make them stronger and we need to make sure they're competing in Europe and not just in the Rabo [Pro12] and that needs finance." Moffett was WRU chief executive when nine professional teams made way for five regions in 2003 and now hopes to win election to the WRU board. One of those teams, Celtic Warriors - a team based on a merger between the Bridgend and Pontypridd clubs, were controversially disbanded in 2004. 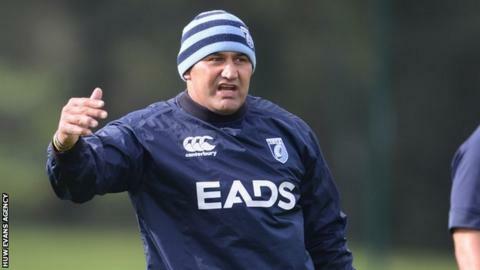 That decision still rankles among many fans at Sardis Road-based Pontypridd, where New Zealand-bred McIntosh spent his Welsh playing and coaching years before moving to the Blues this season. McIntosh questioned whether a fifth region would be feasible alongside Newport Gwent Dragons, Blues, Ospreys and Scarlets. The four teams are represented by Regional Rugby Wales, who remain involved in a dispute with the WRU over funding and control of their level of the game. Pontypridd are in the Welsh Premiership and are the leading semi-professional club in the Blues region. Last weekend they bowed out of the British and Irish Cup at the semi-final stage on try count in a 22-22 draw with Leinster A.
Blues directors were at the game in the Welsh valleys town and McIntosh says they were impressed with what they saw. McIntosh also says the perception of whether or not Pontypridd were representing the Blues region as a whole or only themselves would be doubted by some. "It depends who you ask, isn't it, to be honest? But I think if you ask a Ponty stalwart, he's going to say 'no, this is all about Pontypridd'," said McIntosh. "But all the [Blues] directors were down there watching the game. "Obviously I was there and... we are very, very proud of Pontypridd and proud that they're a Blues team and they're in a Blues region. "So although the fans mightn't think so, the Blues and the directors just couldn't believe the game. They were absolutely dumbfounded at the atmosphere and just the tenacity and the attitude of the boys and that's all they could talk about. "So it holds Pontypridd in good stead with the relationship in this region."